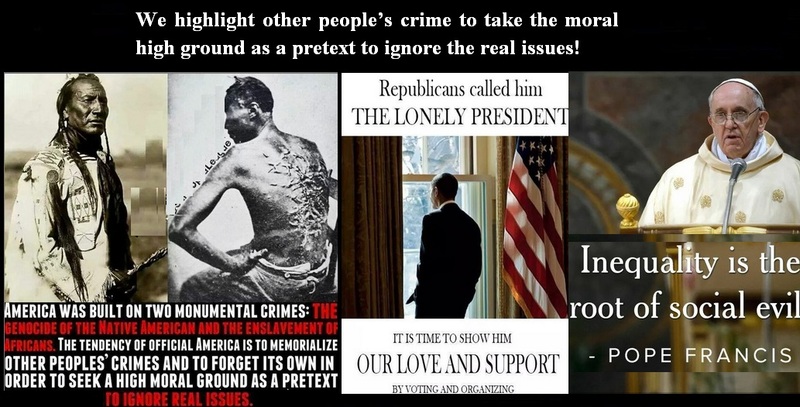 We highlight other people’s crimes to take the moral high ground as a pretext to ignore the real issues! The issue of Race in America! Two  Blacks are killed every week with impunity by White Police. This is a National and International disgrace and one that is never given any attention by Republicans. Between Republicans and Fox Misnomer News, it is self evident that the White Police was more than justified in shooting Michael Brown, the 18 year old teenager six  times. This shouldn’t be a surprise to any sane person because if you look at the reality surrounding President Obama, a man who took over as President under circumstances that no other President had to deal with in the past 50 years. Bush and Cheney reaped havoc on America and the world, they left everything upside down and threw us in deep and unforgiving waters. Obama came along and anyone that says we are worst off today than when President Obama took Office, are being deceptive, uninformed, ignorant and or, so brainwashed that to them, the 50% Black Man is the cause of all that ails America. Earlier today Gallup released another Poll and Obama’s rating fell even lower, it is down to 35%. Why? The Dow was 7,200 when he took office and on Wednesday it closed at 16,979. The NASDQ closed at a 14 year high. Job opening in June stood at 4.6 million, the largest in 13 years. The Housing Market that collapsed by Wall Street Greed and perpetuated by the lack of regulations, bankrupted millions; millions lost their homes and those that manage to keep their homes, they did so with their mortgage under water. And yes, the Housing Market has rebounded. Unemployment that was over 10% with jobs being lost at the rate of 800,000 per month under Bush, job gains since Obama took Office is 10,000,000. Based on recent surveys, 75 of the jobs are high-wage jobs, not minimum wage. The News Media reported that 33% of Americans wanted Obama impeached and one has to wonder why the news couldn’t be, 66% doesn’t want the President impeached. I will tell you why. The 1,500 Television Stations; 9,000 Radio Stations; the 1,500 News Paper; the 3,000 Magazines and the 2,400 Publishers are owned by six  Corporations and big Corporations aren’t friends with Obama. So, the Public no longer hear the News, they hear Opinions, Opinions as directed by the Corporate Owners to their Employees. Today, Americans are more uninformed about the difference between facts and fiction. “WASHINGTON — Nearly two times a week in the United States, a white police officer killed a black person during a seven-year period ending in 2012, according to the most recent accounts of justifiable homicide reported to the FBI. On average, there were 96 such incidents among at least 400 police killings each year that were reported to the FBI by local police. The numbers appear to show that the shooting of a black teenager in Ferguson, Mo., last Saturday was not an isolated event in American policing. The reports show that 18% of the blacks killed during those seven years were under age 21, compared to 8.7% of whites. The victim in Ferguson was 18-year-old Michael Brown.